For the production of architraves in my house I recently decided to pick up a cove cutting jig on sale at rockler. This is a video review of the product. I’ll let the video speak and not repeat everything here. If it works for me it can work for anyone. Thanks for watching. I make raised panel doors on my tablesaw the same way, and it’s not that bad as long as you do them all at once. That is, run all the pieces through at the set height, raise the blade, and then repeat. 8 passes and you’re through 1/2” of wood, so it goes pretty quick once you get in a rhythm. The hard part is cleaning up the curve afterwards – the saw blade leaves a pretty rough surface, even if you go pretty slow. What type of blade / how many teeth , do they recommend to use ? This is a nice review, Daniel. I have looked at these and been considering getting one. Your review was certainly helpful. Dusty, there is no recommendation for teeth on the blade. I’d imagine that the more the better. I have at times, put in a 7 1/2” blade in my 10” table saw from time to time when I haven’t needed the blade height and found that the smaller blade gives the motor a better mechanical advantage. Of course one would be limited to a narrower cove but if I ever do some smaller coves I might do that again. Jimi_c, Good idea about the door panels. And yes the blade does leave narrow horizontal striations in the wood. A scraper seems to handle that well tough and mentioned in the directions of the rockler jig it said to do a very light pass on the last one. That seemed to help a bit. I also made a mirror image curved sanding block and wrapped it with 36 grit sandpaper. That seemed to take off the saw marks really fast. Then to the scraping and final incremented sanding. Well, actually Dusty…. I finished them today. No poly’d yet though. You can see the cove in the bottom half of the top arch. The very top is a double ogee stacked one atop the other. I’ll post it as a finished project later. 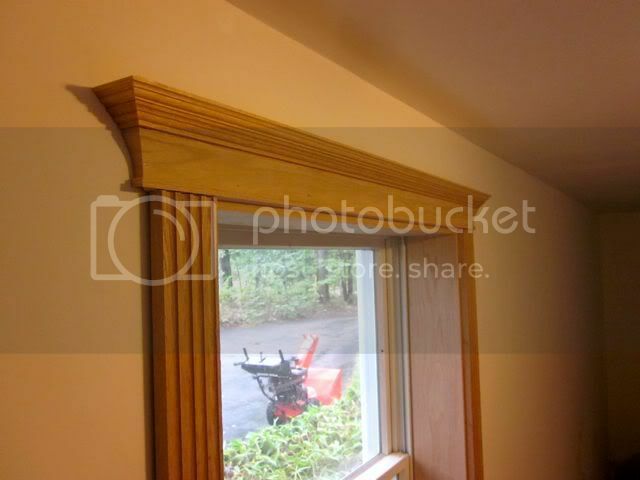 I also used the Rockler fluting jig for the side moldings. I’ll get something on that later. It also works pretty nicely. Cessna, the snowblower? It’s almost time! CMT has a crown molding set with a cove cutting head, Supposed to cut smoother than a TS blade, A bit pricey though $153.30 on Amazon. yes Artistry I see them on Amazon. A bit pricy but I’ll bet it does a nice job. Sort of a router bit for the table saw. The whole crown molding kid is over $300!